The Natal Line owned by Bullard & King had been purchased by the Union-Castle Line in 1919. It then became the practice to put pensioned off Union-Castle ships to Bullard & King giving them Natal line names prefixed by Um. The UMVOTI (above), 1903, was built as Union-Castle Line's COMRIE CASTLE and transferred to Bullard King in 1924. In 1920 when the 1894 SABINE and the ROSYTH CASTLE became the UMZINTO (II) and UMLAZI (II) respectively. The latter was a WW1 standard freighter and to the end retained a single pole mast. Then again, in 1924, two ageing Union-Castle ships, the "extra" steamers and sister ships CLUNY CASTLE and COMRIE CASTLE were transferred to the B-F flag and became the UMKAZI (II) and UMVOTI (II). They had been Built in 1903 and 1904 and, at 5,100 tons, were the largest vessels of the B-K fleet. 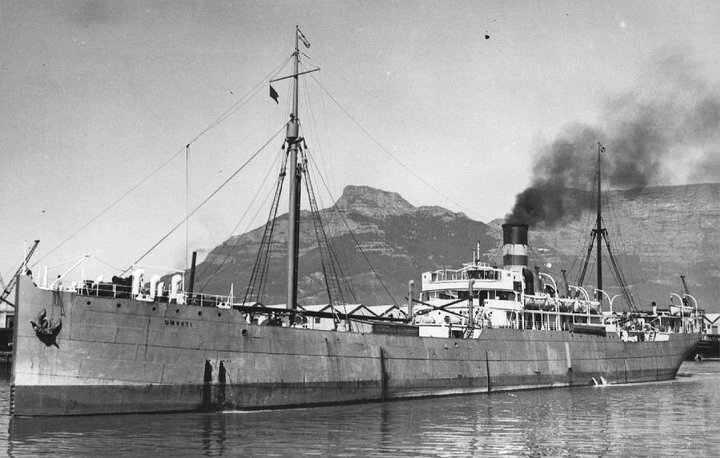 They were ugly ships but during the great shipping strike of 1925 the UMVOTI was pressed into service to carry the Royal Mail from Cape Town, her Indian crew being unaffected by the strike. Both gave long service, the UMKAZI being scrapped in 1938 and the UMVOLI being scuttled as a blockship off Folkstone July 29th 1940, in 1943 the wreck was broken up on the beach. Both were twin-screw ships and did the UK-Cape passage in a leisurely 25 days. In July, 1940, when imminent invasion was expected, I was posted to the 163rd Officer Cadet Training Unit (The Artists Rifles) at St. Martin's Plain, Folkestone on a four month course leading to a commission. Our first month was at Folkestone Harbour, our base the Customs Shed. We did twenty four hours instruction, followed by twenty-four hours guard duty, "two on and four off", sleeping in railway wagons at the end of the harbour wall. From this grandstand we watched ships being sunk in the Channel, and numerous dog fights overhead, as the R.A.F.made sure that Air supremacy, the prelude to invasion, was denied the Luftwaffe. On moonlit nights, patrolling the wall, one could almost see flat-bottomed boats corning in on the tide. As I recall we had five rounds of ammunition apiece and, on exercises, the platoon anti-tank rifle was represented by a length of gas piping. We may have been a bit like "Dad's Army", but morale was sky high. We were a mixed bunch. There were regular soldiers lately back via Dunkirque, experienced N.C.O's seeking a commission, and very green candidates, like me, not long called to the colours, and the Private Soldiers two shillings a day (10p). All walks of life were represented,and it was a time I remember with the pride and nostalgia for which old soldiers are notorious. One day, at about two in the morning, we were roused from our sleep in the Customs Shed, told to dress in shorts and gym shoes, and were "doubled" to the harbour entrance where a small ship,"S.S. Umvoti", was moored. The ship was to be sunk to block the harbour entrance, and so deny its use to an invader. "Get on board and take off anything that can be moved" was the order. This was looting, to which soldiers have never been averse, officially sanctioned! We set to with a will and an application worthy of a swarm of locusts. Everything that was loose was put ashore, and some of our number "won", as the saying went some nice little trophies! However, Authority recognised that we were not yet Officers and Gentlemen, and a search of kit bags and packs took place. Trophies were confiscated, names were taken, some may even have been convicted of "Conduct to the prejudice, etc", but memory is vague on this point. In November I was commissioned into my own Regiment, The Hampshires, and Folkestone was a memory. Looking back to those momentous times, I often think of the "Sinking of the Umvoti", and, when I see a picture of myself on Folkestone Harbour wall in July, 1940, I am reminded of Wellington's oft quoted remarks when he once reviewed reinforcements - "They may not frighten the enemy, but by God they frighten me! 1940 sunk as blockship in Folkestone harbour.